Receiving ISO 13485 recertification is recognition of maintaining the quality processes we have adopted and is a direct reflection of ongoing commitment to operational and production excellence. AccuVein Inc. is the global leader in vein visualization technology. 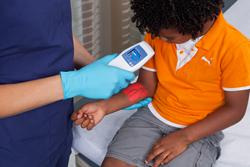 AccuVein’s flagship product, the AV400, is the world’s only hand-held, non-contact vein illumination solution. It allows healthcare professionals to see a map of peripheral veins on the skin’s surface with the goal of accessing or avoiding veins. It is built on proprietary technology as embodied in its growing patent portfolio that covers a broad range of imaging and medical diagnostic technologies. AccuVein is known as a medical device leader and innovator, having won numerous awards including the SPIE (International Society of Photonics Engineers) Prism award for most innovative medical device. AccuVein is in use at more than 5,000 facilities and available for sale in over 130 countries worldwide. To see a demonstration of AccuVein in action, please visit http://www.accuvein.com.